When creating a mobile app one of the key decisions is choosing what functionality to offer your customers. For example, Comet’s app offered users product information and a price checking facility but didn’t offer customers the chance to make a purchase within the app. In comparison, Premier Inn’s app allows users to manage their account and make bookings. Both these apps were created by Grapple and achieved impressive download stats. 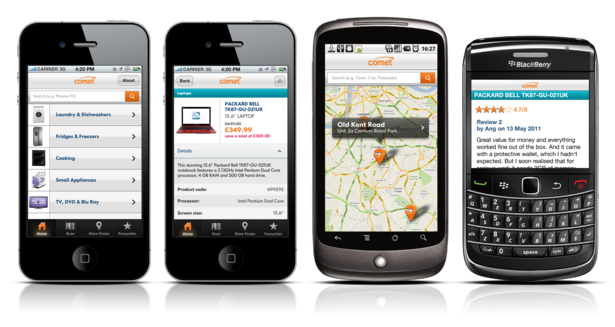 Comet’s app was downloaded more than 100,000 times in the first three months and over 50,000 customers used the app to find their nearest store within the first six weeks. The Premier Inn app has achieved around 1.3m downloads, generating over £2m of additional revenue in the first three months. It currently accounts for around 47% of same day bookings. So how did Grapple and their clients choose what functionality to offer their users? We spoke to Grapple CEO Alistair Crane to find out more about the development process. The Comet app has achieved some impressive usage stats. How did the development process work, and how did you decide which features to include? I think often the assumption is we are given a brief and clients know what they want, but it’s actually quite the opposite. More often than not they want to sell more or raise awareness and we go from that basic concept to working out what the proposition should be. Often new apps work as a research tool, so clients want to know how people will use the app and what features it is necessary to have. But the Comet app has been a success. It has had 120,000 downloads across platforms, 20,000 barcodes have been scanned and 46% of customers return to the app each month. Within the first few weeks of launching, it accounted for 2% of web sales with this figure rising to 20% over the key Christmas period. Why did you decide against having giving users the ability to purchase items within the app instead of linking out? The features included in each app vary with each client. One of the key factors is the amount of time you have before it needs to be available in the App Store. Clients often want the ‘minimum value proposition’, which means we get to market as soon as we can without putting out a useless app and getting egg on our faces. Once the app is live we probably update it once every four to six weeks, which isn’t necessarily major updates just minor changes and tweaks. Bigger updates are seasonal and take place around the busy sales periods, so we have a huge amount of work to do in the run up to Christmas for instance. But there’s no list of things that it is integral to have – in general we like to offer customers something that makes the sales process easier. How are the updates managed? Are you constantly working on new features? We have a contract to develop the apps on an on-going basis, and we have a team of people dedicated to updates and maintenance. One of the important aspects of having an app is the data that comes back from it. You need to know and understand how people are using the app as this informs future upgrades. The only way you can really do that is with a dedicated team who understand how the app works. Do you think retailers should offer free Wi-Fi in-store as standard? If you want the customer to have the best possible experience then you need to give them Wi-Fi in-store. If you are offering customers a mobile experience through a mobile optimised site or an app then it doesn’t make sense to ask them to pay to use it with 3G data. A recent survey suggested that customers should be given more information in-store through the use of QR codes and augmented reality on product labels. Is this something you think could work? I think AR or QR codes on products is a great idea. We are currently in talks with some high-end brands about including digital tags in their products to verify that it is real and not a counterfeit. Luxury brands face a real problem with piracy and the most common tactic to prevent it is to use holograms. To replace that you could stitch a chip or a symbol into a product to verify that it is authentic, but also to give access to an exclusive club or digital content. Barcodes are all over the place anyway, so there is a lot of scope to do more with those. Travel companies have been quick to realise the potential for capturing new customers on the move. How did the development process work with Premier Inn? Premier Inn’s issue was that it took less than 0.1% of bookings through mobile, despite the fact that 10% of visits came through mobile. They wanted to change that, but were concerned that the app would just cannibalise their existing online bookings. However the data we got back showed that the app added to incremental revenue. The app has made Premier Inn a considerable amount of money from what they call ‘corporate soldiers’ – these are people who end up staying late at a business meeting and need a hotel next to the office so they can be back in early the next day. We’re also working with them on providing entertainment options to their guests – it’s not something they currently offer as it costs too much and doesn’t fit with the brand. They already have free Wi-Fi for all guests, so we are looking at creating an aggregated entertainment service similar to Netflix. The customer would get a free movie rental, but they have to register so in return the supplier would get some of their data. Why should Premier Inn have an app rather than a mobile optimised site? The mobile site is important as that’s all about capturing the casual customer, but the app allows you to offer a much richer experience. For instance, customers can collect loyalty points and manage their bookings within the app, which is something that is far more difficult on the mobile web. Obviously you need to get people to download the app in the first place, so we cross promote it on the mobile site and drive awareness that way. Customers that have an account really like to use the app and that is where up-sales and rebookings come from. Can an API replace business development? Is your mobile app better than your website?